Sam Holden comes to the final table of the WSOP Main Event as the shortest stacked of the November Nine with just 24 big blinds. The 22 year-old from Canterbury, whose only previous live poker cashes were on home soil in UKIPT events, has had a very busy time in his first year as a sponsored pro for 888 poker and has just also moved to London – a city that takes a lot of getting used to! Sam´s seat at the final table was due to an uncanny knack of picking the right time to get all his chips into the middle. Drawn on the same table as Day 7 chip leader Anton Makiievskyi, Sam managed to double up his 4 million chip stack against Ben Lamb (A♠ 9♥) with A♦ J♥, and then busted Ryan Lenaghan when A♠ Q♠ turned a flush against Lenaghan´s A♥ 8♥. Despite sitting between the aggressive (and well-stacked) Anton Makiievskyi and Pius Heinz on the 10-handed final table, Sam managed to play calmly and get his chip stack up to 12,375,000 for when play resumes on Sunday. What´s Sam Been Doing Since July? Sam´s commitments to 888 Poker have taken up a considerable amount of time, as have the attentions of the British poker media. He played in the EPT London, WPT Paris and WSOPE Main Event in Cannes – where his knack of picking the right spot to shove let him down in a Tens -v- AK race – and also appeared on the Late Night Poker TV program. 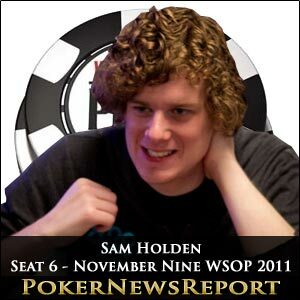 Sam has also spent a considerable amount of time studying his November Nine opponents in the hope that he will have the opportunity to improve his position on the WSOP Main Event final table into one from which to mount a serious challenge. For a 22 year old, Sam seems to have a mature head on his shoulders and, if the right cards get dealt to him at the right time, you could see him work his way up the leaderboard. The bookmakers odds of 14/1 are a pretty accurate reflection of his chances, with Pius Heinz, Ben Lamb and Martin Staszko all having position on him and, although we would love to see Sam win the tournament for the UK, we cannot genuinely see him getting past Sunday´s rising blinds.